Papermill Creek Children’s Corner director Lourdes Romo receives the grant from the 8th grade class! 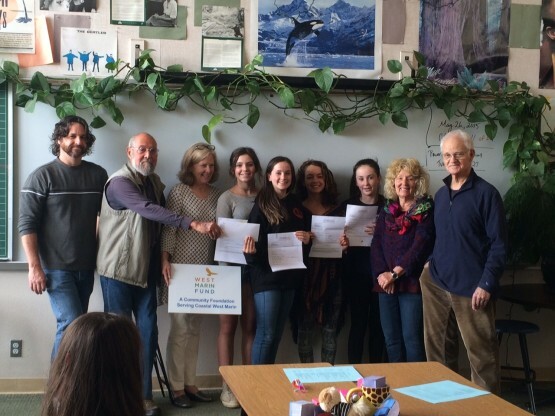 “This was a really nice collaboration between the West Marin School and the West Marin Fund, and provided a unique opportunity to have the students use their research, problem solving, and writing skills in a real life situation. 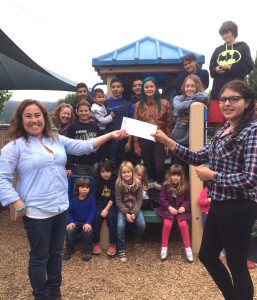 Nicasio school 8th graders receive $2000 to award their grants to the local non-profits they selected. The West Marin Fund rolled out a Pilot Project in two schools this year, so students could explore what it’s like to be philanthropists to local non-profits. 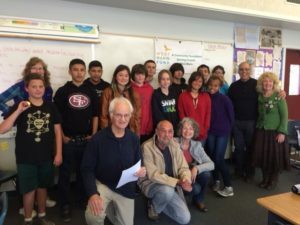 In the West Marin School‘s 8th grade class (teacher Julie Cassel) the students researched a wide range of non-profit organizations, interviewed their directors, and then wrote up proposals about much-needed support at each organization. The 12 excellent proposals went to our Giving Through Youth Grants Committee, and checks were delivered May 19th to the 5 organizations who shared the $2000. pool of funds. 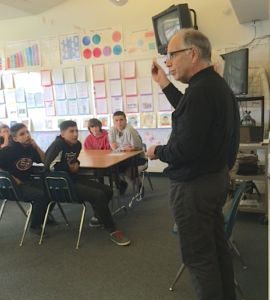 At the Nicasio School, 8th grade students divided the $2000. pool of funds among 4 local non-profits in Nicasio. Teacher Colin Williams says the students heartily embraced the project and learned a lot about community service along the way. Next year’s students look forward to having the same opportunity. We are proud of the students and their thoughtful work — and we are pretty sure we’ll be seeking funds to get this project into all of West Marin’s 8th grade classes for next year. We welcome your support. Giving Through Youth! 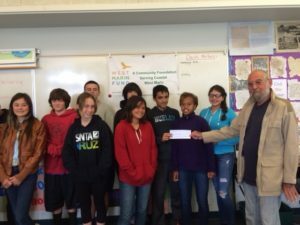 Thanks to a gift to the Fund from Richard Kirschman (presenting the checks) the 8th grade class at West Marin School granted $2000. to West Marin non-profit organizations. They did research in our communities, wrote proposals, and sent them to our Grants Committee for selection. This Pilot Project looks like a success! (and we need donors for next year!) Thanks to teacher Julie Cassel for teaching kids to care this way. Steve Costa gave each of the students a $3. West Marin coin, showing them another way people can contribute to non-profits in their communities. The coins generate thousands annually for non-profit organizations… all you have to do is buy them and use them.